The polymerase chain reaction (PCR) is a test tube version of the same process of DNA replication that is found in the living cell. It is a fast and inexpensive way to amplify, or make many copies of, small segments of DNA. This is necessary because methods used for analyzing DNA (determining the DNA base pair sequence) require more DNA than may be in a typical sample. A particularly useful feature of PCR is that it allows the amplification process to be limited to specifically targeted segments of the DNA mixture--such as the Y chromosome markers used in genealogical testing. When your vials of cheek cells or saliva arrive at the lab for testing, the DNA is extracted and purified. They are first mixed with a detergent which causes the cells to burst open and release their DNA along with other cell contents. The mixture is then washed with a phosphate containing buffer (mild salt) solution to dilute cellular debris. With minimal preparation, the sample is ready and the DNA on the targeted area of a chromosome can be amplified. PCR is based on the ability of a DNA polymerase enzyme to synthesize a complementary strand to a targeted segment of DNA in a test tube mixture of the four DNA bases. Because DNA polymerase cannot initiate adding bases to a DNA strand, the mixture must also contain two DNA fragments called primers. Primers are about 20 base pairs long and have sequences complementary to areas adjacent to each side of the target sequence. Primer design requires that the DNA sequence around the segment to be amplified is already known. Primers can be constructed in the lab, or purchased from commercial suppliers. 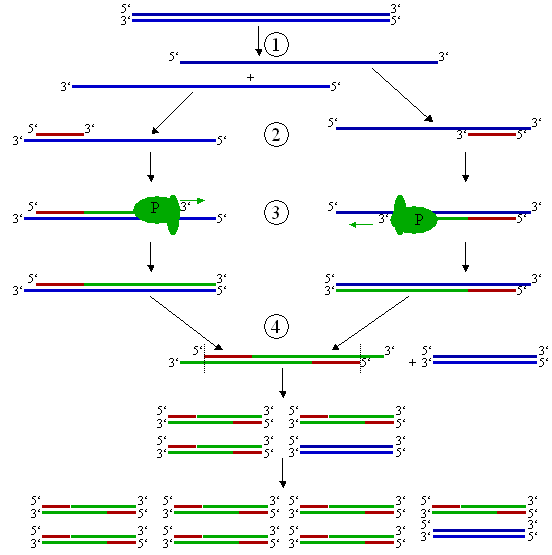 If chosen well, the 20-25 base pair sequence will be unique in the entire human genome so will match only the place specifically chosen. This will insure the area to be copied will be limited to the specific target segment. For an informative video about primer design see the PCR Primer Design tab at the top of this page. The basic process of PCR is illustrated in the diagram below. Magnus Manske [CC BY-SA 2.5 (http://creativecommons.org/licenses/by-sa/2.5), GFDL (http://www.gnu.org/copyleft/fdl.html) or CC-BY-SA-3.0 (http://creativecommons.org/licenses/by-sa/3.0/)], via Wikimedia Commons. 2) It is then cooled to 68° C to allow the primers to find and anneal (bind) to their complementary sequences on the separated strands. 3) The temperature is then raised to 72° C and the polymerase (P) extends the primers into new complementary strands to each of the original DNA strands. 4) The first cycle is complete. The two resulting DNA strands make up the template DNA for the next cycle, thus doubling the amount of DNA duplicated for each new cycle. The entire cycling process of PCR is automated and can be completed in just a few hours. It is directed by a machine called a thermocycler, which is programmed to alter the temperature of the reaction every few minutes to allow DNA denaturing and synthesis. To avoid the destruction of needed enzymes in the mixtures by the high temperatures needed to denature the DNA, enzymes from bacteria that thrive in hot springs are used for the process. 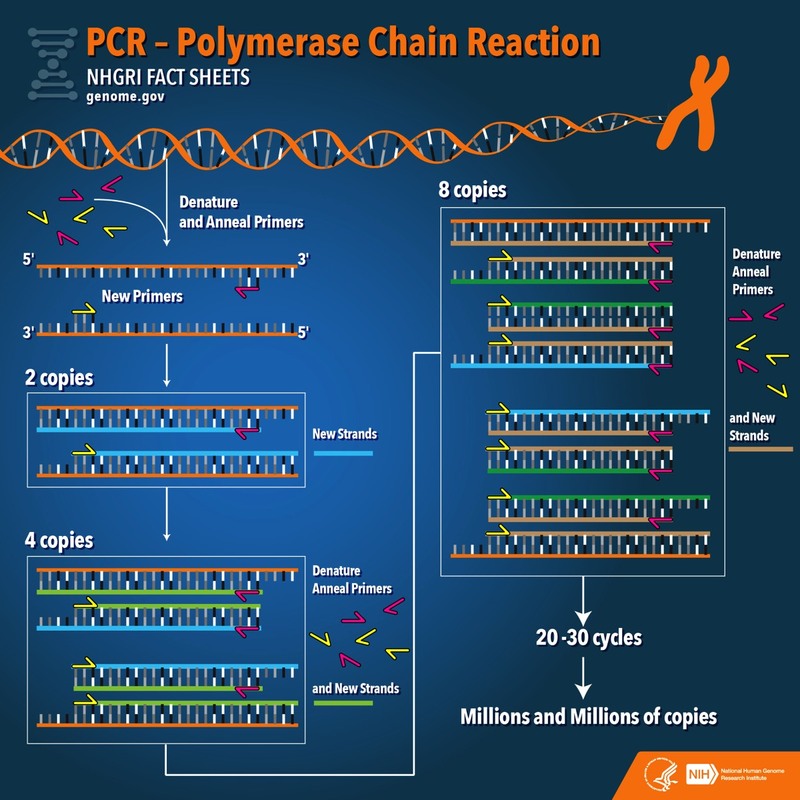 Once amplified, PCR products can be used in many different laboratory procedures; for example, most mapping techniques in the Human Genome Project relied on PCR as a step in the process. PCR is also valuable in a number of newly emerging laboratory and clinical techniques, including DNA fingerprinting, detection of bacteria or viruses (particularly AIDS), and diagnosis of genetic disorders and preparing samples for genealogical DNA testing. This video is made by a commercial company that provides enzymes, primers and other supplies to laboratories doing PCR. As such, there is a little advertising but the information and presentation are well done and address some of the issues involved in conducting successful PCR in the lab. These videos are for the more advanced student or for those who just think this is an exciting, wondrous topic!